Bring dawn all ingredients(4) and reach 40000 points to complete the level. You have only 20 moves. This level is little bit hard as scoring 40000 and taking two cherries and two onion ingredients to bottom isn’t that easy. 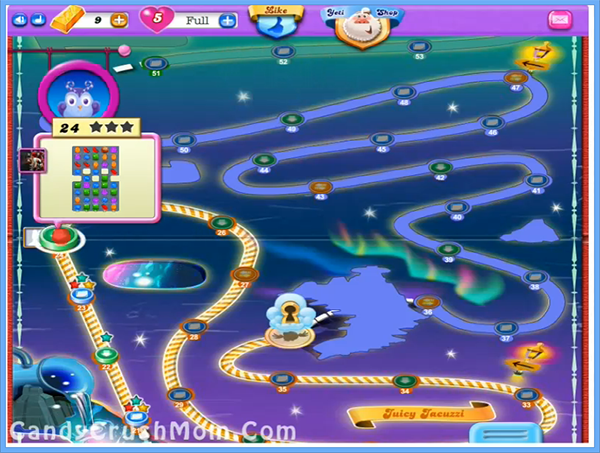 To complete this level you must need special candies like striped candy that you can get by combining four same color candies and try to combine special candies to each other. You should also try to break candies that are below ingredients and might be you need to take down all three ingredients to bottom then last one will appear. You can also try to increase moon power by playing more with candies that Odus owl have so it will break candies as it will be full and don’t forget to balance the owl. We completed this level 39 candy board with four ingredients by 52120 score within last move by trying on playing more with special candies and candies that owl have.